Hello, I’m Ian. I do the tournaments for White Wizard Games. I also write the lore, but that’s a different skill set. 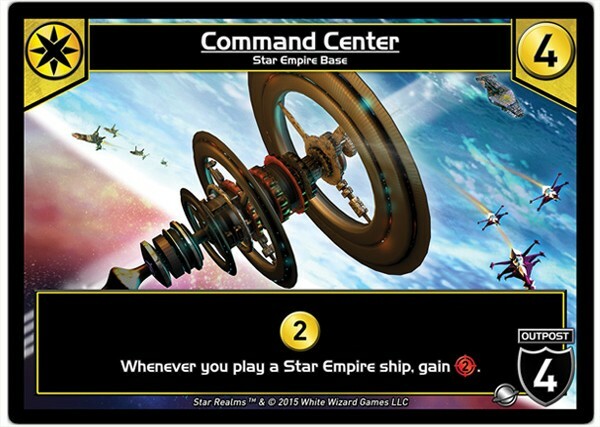 Over the past year, we’ve been running the Star Realms Legend series at major cons, as well as running smaller pickup events, and I’m here today to talk about how we did that. Most of us come from a heavy tournament background. I have over 20 years experience as a judge/referee/official, and Rob Dougherty has been a premier tournament organizer in New England for about that long, and we have both run hundreds of events (many of them together). That’s actually how we met. So we’re used to running competitive events with a good amount of efficiency, making things fair and fun for everybody involved, and with the minimum amount of despair howls. However, Star Realms is a different animal. Star Realms players can be from a competitive background, but the broad appeal of the game means that we’re also attracting a lot of casual players who would like to try their luck at being characters in the game. With so many expansions, it’s tempting to load up the tournament experience with Heroes, Events, Missions, and Gambits. However, it quickly becomes overwhelming for players, and a logistical nightmare for the poor sap of a tournament director that has to open a bunch of packs and make sure each of 30 decks is correct. Also: while every Star Realms card is a shining gift from the gaming gods, some people aren’t as enchanted with certain newer card types. Yeah, I don’t get it either. -Discard effects happen immediately, not at the start of a player’s turn. -Players may not look through their decks, or their opponent’s deck. -Ally abilities do not automatically trigger. They may be triggered at any time after the card is in play (as long as it is still in play). -You don’t have to play every card in your hand. There are a couple more differences (such as the app won’t let a player destroy their own bases) but these were just weird so I didn’t include them. Despite how I might come across, I don’t like saying weird things. The last thing I did was, as a judge, I decided to not issue penalties. I would fix illegal game actions, but unless a player did something so egregious I had to remove them from the match, I’d let things slide. Since my first event at Origins 2015, I have yet to regret this policy. Sometimes when people had encountered problems (rather than rules questions, which were rare), I would be asked to adjudicate. Here are the most common, and my responses. -I accidentally shuffled my base into my deck. If it just happened (ie, you’re still shuffling), fish it out. If you found out by drawing it two turns later, sorry, too late to fix. -I took damage last turn, but I have an Outpost in play that should have prevented that damage. Make the adjustment, but if it would be disruptive (ie, more of a fix than just putting the base into the discard pile and adjusting your Authority total), then your Outpost defences were offline and they didn’t protect you. I’d have a few words with that security chief of yours. -I did 12 damage to my opponent last turn, but I just realised it should have been 14. If we just discovered this, we make the adjustment. If more than a turn has passed, you missed the opportunity. I’m sure you’re seeing a pattern here. If we can fix it easily, we do. Otherwise, we leave the game as it is. In all these cases, we verify the facts with the opponent. Mostly the opponents will agree, but sometimes they might have different facts. If the players can’t agree, it’s perfectly ok to leave the game as it is. -Do I have to use the Authority tracker cards that came in the box? NO! The Authority trackers are an interesting way to keep score out of the box, but for tournaments they are impractical and imprecise. I strongly encourage players to use anything else. Pen/paper, dice, or an app are all good solutions. Many players think it’s the “official” way. I assure you, it’s not official, encouraged, or endorsed by your friendly neighbourhood Director of Organized Play. This actually resulted in very few draws. Overall, everybody seemed happy, and the Legend Series events were very well received. Casual players enjoyed them, and the more serious players seemed to be having something Earthlings call “fun”. The top 8 was always Core Set, and best-of-three. We also ran the matches untimed. They were generally done within the hour. When we got to the finals, we allowed the players to split the prize unevenly, and for one player to drop. (This is done at many types of TCG events to the point where it’s sort of expected. We opted to do it to give the players some control over their tournament experience.) 1st prize was an iPad (or the $500 cash equivalent) and the ultimate prize of being featured in an upcoming Star Realms release. Second prize was much less. The players could decide on $250 each, and play for the card, or one could take $500 and have the other player get the card. The players could do what they liked, as long as they didn’t introduce anything from outside that prize pool. The Legend Series is a hit, and we will continue doing it. We will still be a presence at the large cons, and whatever other cons to which we can drag ourselves. We’re also going to be looking at ways we can drive instore play for both Star Realms and the upcoming Hero Realms in a way that’s fun and accessible. If you have some ideas, and you honestly think your ideas are better than mine (remember, I think I’m pretty terrific), I’d love to hear from you! So what is the final ruling on the Machine Cult Junkyard? Is it a ‘must’ scrap a card, or can the player choose to play the ability?